This week’s BotW is the latest from long-time auto-buy author of mine, Trisha Ashley. If you’ve been here a while this choice will not surprise, you because you’ll know that I’m a big Trisha Ashley fan. I’m on her mailing list, I go to her London readers’ tea party, I keep her books on the special downstairs bookshelf of books I might need to have handy to read again AND I have copies of most of them on Kindle. 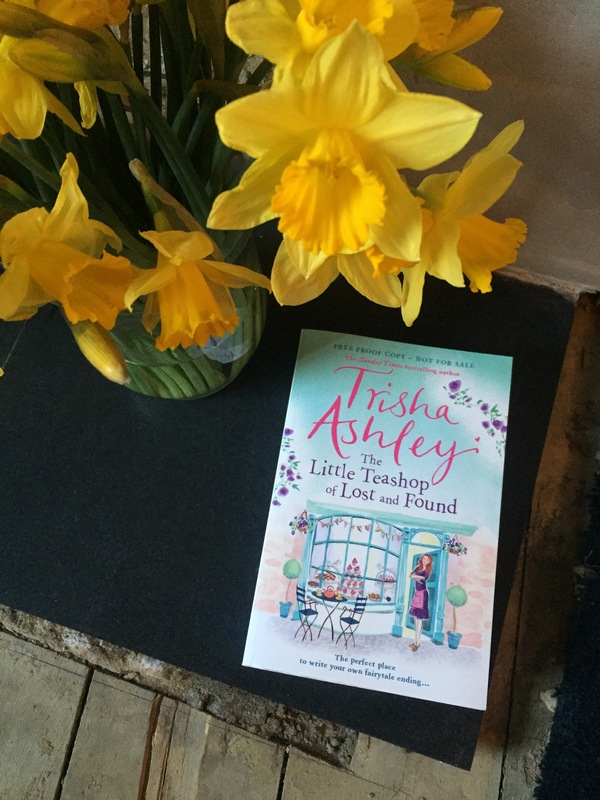 So you can imagine how delighted I was when I got an advance readers copy of her new book The Little Teashop of Lost and Found – and how much willpower it took not to squeal all over the place, read it straight away and then immediately blog about it. But I have been restrained. Very. It helped that I had to pack all the book piles away for the fireplace work – and that they still haven’t been properly unpacked. It helped that I knew I had nights coming right before it was due out and that this would be the perfect book to save as a post-nights* treat to myself. But still. Points for will power for waiting to read it so that I could post this the week that it comes out. Anyway, you want to hear about the book, not about my crazy fangirling, so here we go. Check out my attempt at pretty photography. I like the contrast of the daffodils and the book cover. The Little Teashop of Lost and Found tells the story of Alice, abandoned on the moors above Haworth as a baby, adopted and then abandoned again in various ways by various people as she grows up into adulthood. Always feeling like an outsider, after her latest setback she buys a rundown cafe in Haworth in the hope that being close to where she was found might help her find the home and the family that she’s been searching and longing for. While she’s setting up her tea emporium – and writing her book – she makes friends and starts to try and unravel the mystery of who she really is. But will she get her happily ever after? Trisha Ashley’s heroines tend to be looking for a second chance at love and have tragedy in their past – and Alice is no exception. ** She’s had so many knock backs and tragedies that it’s a wonder she’s still in any way optimistic about the future. And life in Haworth isn’t plain sailing at first, although she soon acquires a surrogate family to help her along. I liked the interludes with extracts from the dark and twisted fairy tale that Alice is writing and I loved the secondary characters – the Giddings family, Lola and the rude waitresses with the hearts of gold are all brilliant. And I really liked the other intercut sections that I can’t talk about without giving too much of the plot away – they’re so cleverly done that I had to go back and reread some of them at the end in shock to check I hadn’t missed something earlier! This is warm, witty and uplifting as well as being a great slow-burn romance where the reader and every one else around the heroine can see what’s going on so much more clearly than she can. This is also (obviously) set in Yorkshire rather than the more traditional Trisha-world of Lancashire but there are some familiar faces here despite that. If you’ve read the novella Finding Mr Rochester you’ll spot some characters from there – in fact I need to go back and read it again to see exactly how many characters from that pop up in this. The Little Teashop of Lost and Found is out in hardback on Thursday (the 9th) and you can get your copy from Amazon (for a bargainous £6.99 at time of writing), Waterstones and Foyles or buy it on Kindle or Kobo. The paperback isn’t out until June, but you can pre-order that from Amazon, Waterstones and Foyles too. I need to get myself a copy too – because the ARC doesn’t have all the recipes in the back! *Proof reading this was a real hoot – I wrote this when I was still quite nightshift-brainy and when I came back to check it, well lets just say it was a haven for unfinished sentences, typos and mismatched tenses. I think I’ve fixed them all, but hey, if a few have crept through, I’m sorry! **In fact I think the heroine’s backstories are getting sadder – Tabby from Christmas Cracker had been in jail (she was someone else’s dupe), Cally in Wish Upon a Star had a seriously-ill daughter, Izzy in Creature Comforts had been involved in a serious car crash, now Alice abandoned at birth. I don’t know how the books still end up being so cheerful and uplifting!